Light to moderate weakness has developed through the complex. Increased pressure may continue to be seen late in the day in live cattle and feeder cattle markets. Hog futures have posted strong gains Wednesday. Strong gains in hog futures have done very little to support the cattle complex through the morning. Traders are split between fundamental market shifts and outside market moves seen through the morning. Corn prices are lower in light trade Wednesday. July corn futures are 2 cents lower. Stock markets are higher in light trade. The Dow Jones is 16 points higher while Nasdaq is up 21 points. Moderate price pressure is seen through the entire complex. This is holding market losses firm as traders continue to look at pressure in grain and feeder cattle trade. The overall lack of support in the complex could bring additional weakness to the market through the end of the session. Limited trade volume may minimize additional losses, but the tone of the market seems to be shifting away from recent support. Cash cattle activity remains quiet with bids developing through the morning. Bids are seen from $110 live basis to $178 to $180 per cwt dressed. It still may be later in the week before actual trade develops. The Fed Cattle Exchange Auction today listed a total of 596 head, with zero actually sold, 309 head listed as unsold, and 287 head listed as PO (Passed Offer). 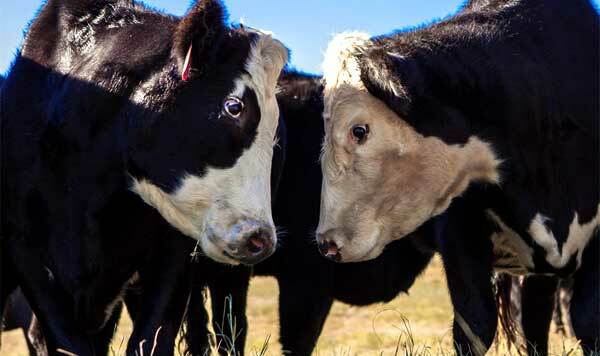 Only Kansas and Nebraska had cattle listed on the auction today: KS 438 total head, with 0 head sold, 309 head unsold, 129 head listed as PO ($112.00); NE 158 total head, with zero head sold, and 158 head listed as PO ($100.00). All cattle listed were set for a 1-to-9-day delivery date. Boxed Beef cut-outs at midday are higher, $0.17 higher (select) and up $0.50 per cwt (choice) with light movement of 75 total loads reported (30 loads of choice cuts, 14 loads of select cuts, 6 loads of trimmings, 19 loads of ground beef). Light to moderate volume is seen in cattle trade. This is pushing feeder cattle markets 10 to 90 cents lower at midday based on pressure in live cattle trade and lack of additional buyer support willing to move back into the feeder cattle complex. There may be some additional movement through the end of the week, although prices seem to be hovering in the current range for now, and may hold this pattern through most of June. Sharp gains have quickly developed in nearby lean hog futures. This is helping to draw additional underlying support into all hog trade. Nearby contracts have posted gains of $1.80 to $2.15 per cwt with the focus on increased overall support seen in all nearby contracts and underlying support still developing through the coming days. Cash prices are unreported due to confidentiality on the National Direct morning cash hog report. The National Pork Plant Report posted 148 loads selling with carcass values falling $0.03 per cwt. Lean hog index for 6/08 is at $75.79 up 1.22 with a projected two-day index of $77.18, up 1.39.